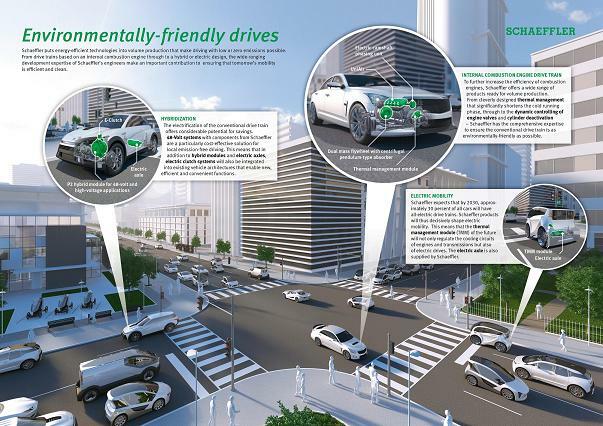 Schaeffler has been presenting its environmentally friendly drive systems including electrified drive trains at the International Motor Show in Frankfurt. Governments around the world are pursuing more stringent emission control regulations to continually improve air quality in urban areas. The European Union, for example, since September 1, 2017, has required Real Driving Emissions (RDE) tests measuring emissions in real-world traffic and no longer merely on test benches. China on the other hand is planning to establish fixed quotas for electric vehicles with zero local emissions. “The technologies needed to meet these requirements are available,” said Prof. Peter Gutzmer, Schaeffler’s Chief Technology Officer. “We already have several production orders for our very compact and powerful electric drive systems.” At the same time, Gutzmer pointed out the need to design future internal combustion engines for even greater efficiency and lower emissions. The second-generation thermal management module presented by Schaeffler at the IAA motor show, and now making its debut in volume production, offers a solution to this issue. This module controls the cooling circuits of the engine, the transmission and additional electric drive units, if applicable, plus that of the battery. At the beginning of the warm-up phase, all cooling circuits can be completely shut off to enable accelerated heating of the individual systems. The circuits managed by the module can be systematically controlled, depending on operating conditions and heat requirements in the vehicle’s cabin. The actuators used in the thermal management module influence the functionality and service life of the engine too. Schaeffler has developed a modular kit here that is tailored to the respective requirements. Measurements have shown that the utilisation of a thermal management module enables it to achieve up to three per cent improved fuel economy even in the New European Drive Cycle (NEDC) test – and even more following a cold start at low outdoor temperatures. “The dynamic timing of the engine’s valves is another important influencing variable,” says Prof. Peter Pleus. The reason is that a major portion of the total emissions is produced in acceleration phases. Engine designers can effectively counter this by short-term adjustment of the opening and closing times of the intake valves through which air and recirculated exhaust gas flow into the cylinder. To enable fast adjustment even in dynamic driving modes, Schaeffler has developed an electric camshaft adjuster and successfully introduced it into volume production. Greater variability, less consumption and lower emissions: these advantages are also provided by systems that shut off one or more cylinders in low-load driving conditions. As a result, the cylinders that remain active operate in a more efficient load range. The hydraulic-switchable valve tappet developed by Schaeffler allows individual cylinders to be deactivated. In 2018, the first three-cylinder engine using such a system from Schaeffler will go into production. A dual-mass flywheel with an integrated pendulum-type absorber – another product developed by Schaeffler – prevents negative effects by the temporary two-cylinder operation on NVH (acoustics, vibration and harshness) performance. Considerable improvements are possible by electrification of conventional powertrains, a 48-Volt system being a relatively low-cost solution. In current production vehicles, this system, instead of a starter-generator, is connected to the crankshaft of the internal combustion engine via a belt. For future vehicle generations, Schaeffler also offers the integration of the 48-Volt electric motor into the engine-transmission unit and into the axle. Provided that an electric motor with the requisite power output and a battery with sufficient capacity are used, solutions such as this even make “active coasting” possible at higher speeds – the vehicle maintaining its speed in spite of the IC engine being shut off. In addition to enabling considerable reductions in fuel consumption to be achieved, the energy generated in deceleration phases can be recuperated more effectively. For example, the electric power gained as a result may be used to operate an electrically heatable catalytic converter and to thus achieve emission levels far below current legal limits. A plug-in hybrid powertrain enables even greater savings in fuel consumption due to driving with local zero emissions across longer distances. For more than ten years, Schaeffler has been working on the central element of such a powertrain: the high-voltage hybrid module. As far back as 2010, Schaeffler delivered major components for such a propulsion system. Now production of the next generation of the hybrid module that will enable the transfer of very high torques of up to 800Nm is about to be launched. A patented branching of the power flow within the module makes it possible to transfer such high torques. In addition, the hybrid module can be combined with the converter in automatic transmissions so that even vehicles with very large mass – such as car-trailer combinations commonly used in the North American market – can comfortably pull off from rest. Particularly suitable for battery-electric vehicles are traction systems that are integrated into the axle or even into the wheels. While the electric wheel hub motor is still a pre-development topic, volume production of the electric axle from Schaeffler is imminent. Currently, the supplier’s engineers are working on four production projects in parallel.